Welcome to Pixontrips. 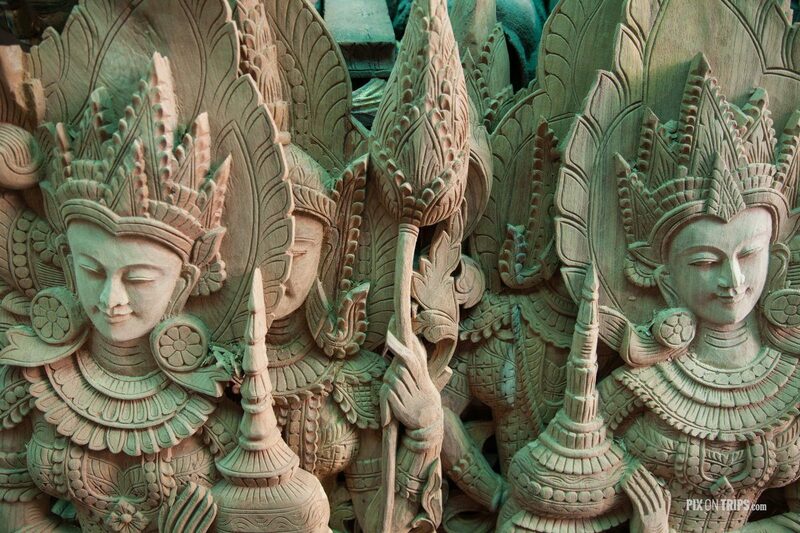 This is my first post in a new series called Around Southeast Asia in 24 Days. I’ll be writing on a weekly basis about the various destinations I visited over the span of three and a half weeks this May. My first touchpoint in Myanmar was in Mandalay—the country’s second largest city after Yangon (and also the name of a popular Las Vegas hotel). Located in the northern part of the country, at last count in 2014, the city was home to 1.2 million people. 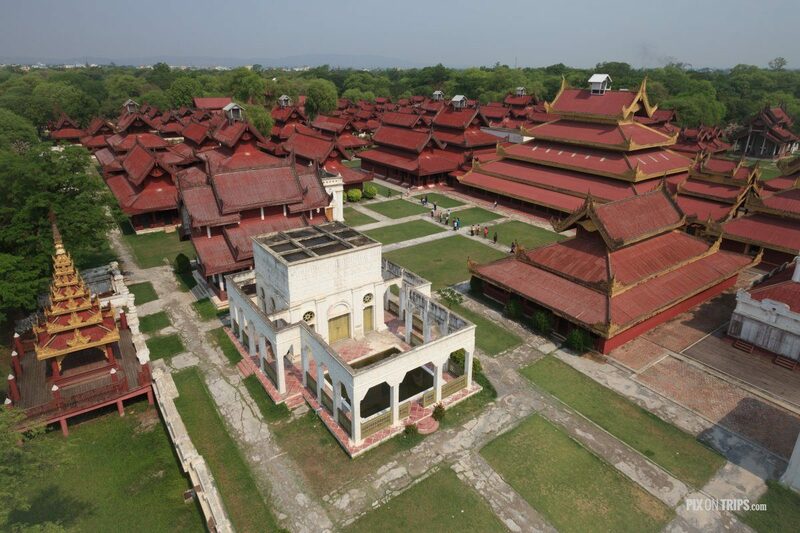 Mandalay is filled with run-down buildings and restaurants, sheltered by only a steel roof. Motorycles dominate the roads and seem to get on just fine, in the absence of traffic lights. The seeds of Western civilization have only recently started to sow themselves, as seen by the Telenor blue umbrellas and signs that are ubiquitous around town. The people in the country are amongst the most gracious and hospitable I have ever encountered. 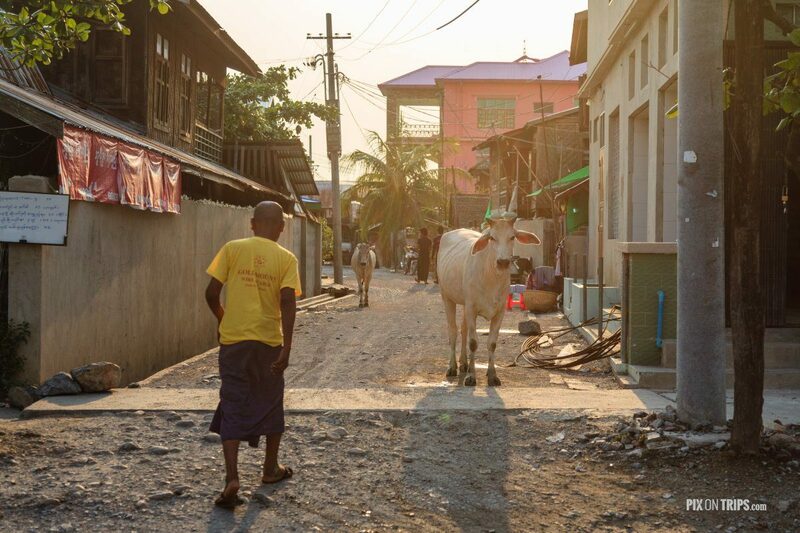 With the country’s tourism boycott having been recently lifted in 2010, many Burmese are still fascinated by foreigners and will often ask for a photo. 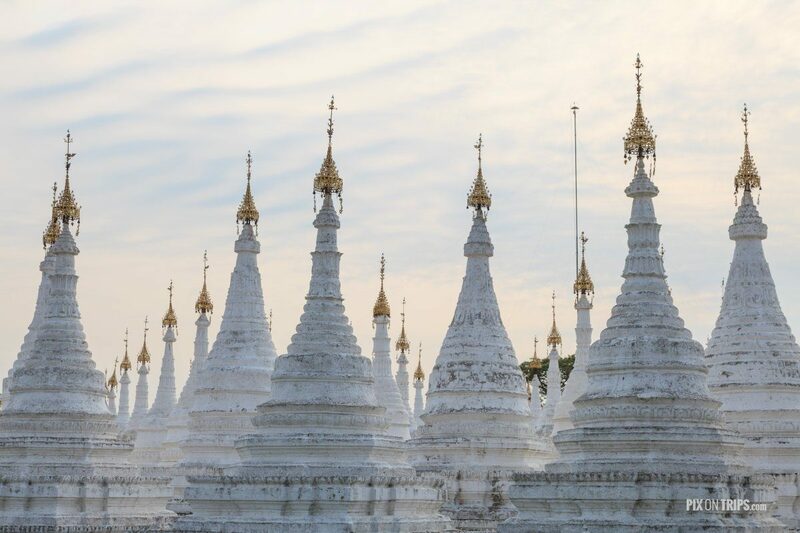 In this country, history and tradition are beautifully preserved, witnessed by the abundance of ancient religious monuments still standing, but more widespread, through the hanaka (a light yellow paste made from ground bark) used by the Burmese on their skin to protect themselves from the sun—a practice that is over 2,000 years old. Arriving in Mandalay was admittedly a little overwhelming. Our driver blasted loud Burmese music in the car (which was strangely alluring and exotic) while driving in from the airport. The road was primitive and devoid of signage. 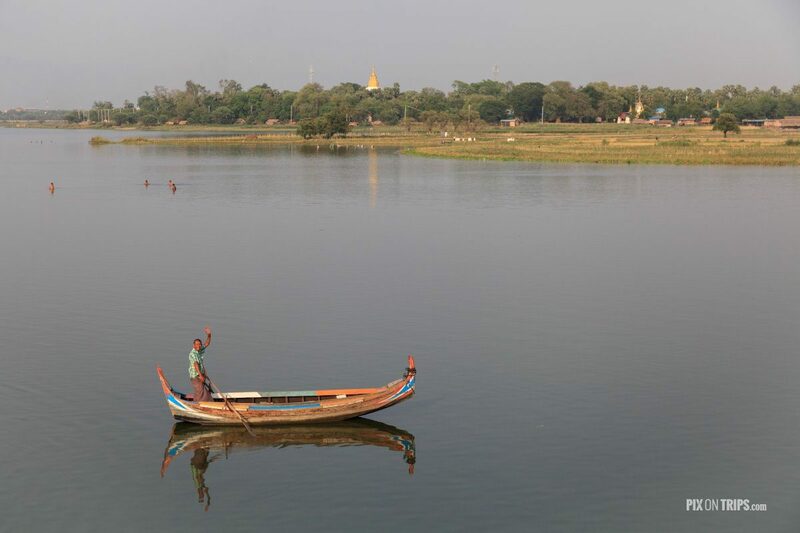 Outside, yellowing fields and resilient trees stretched on, save for the occasional pagoda in the distance and fruit stand on the side of the road—no buildings until almost an hour later when we started approaching Mandalay. 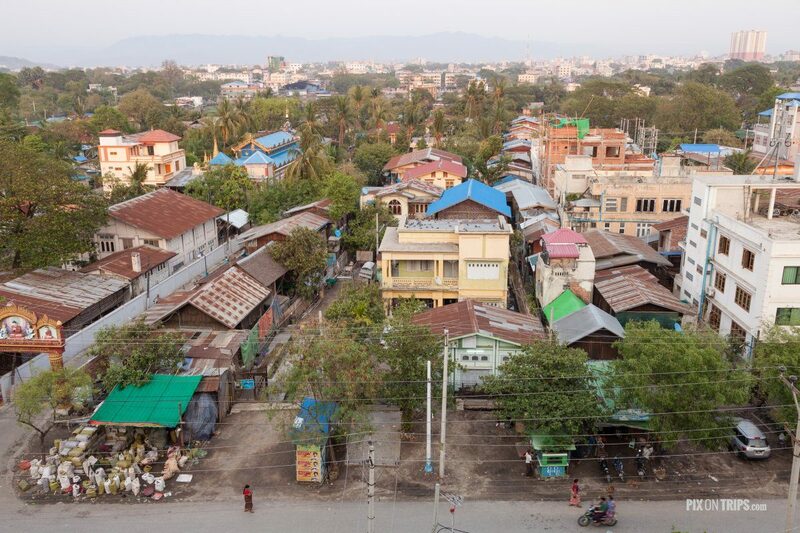 Driving past sprawling block after block in central Mandalay, I remember worrying about having decided to come, as the city projected a grungy, hectic vibe, and the heat was almost unbearable up in the mid-forties (Celsius), having come from a country where the hottest of our summer days reached a meagre 35, in a hot year. 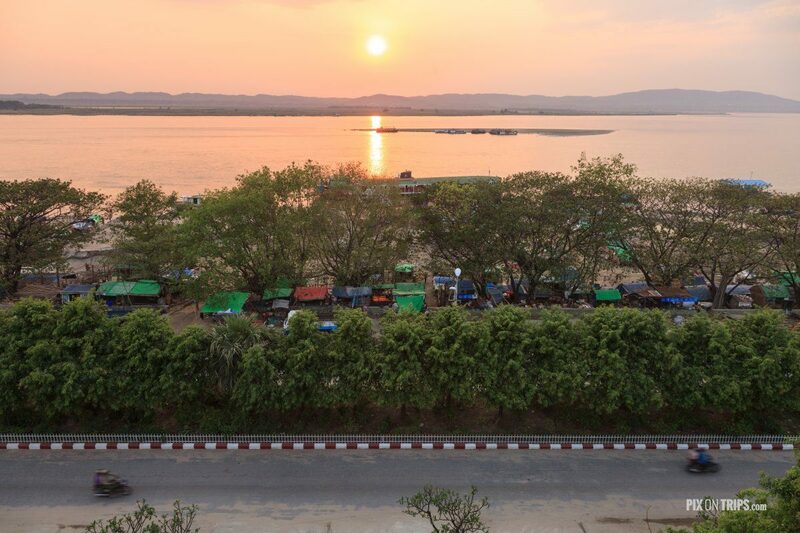 Having only settled in late afternoon, we decided to relax the rest of the day and went to the rooftop restaurant of the Ayarwaddy River View Hotel to catch the sunset, as recommended by the staff at our homestay. 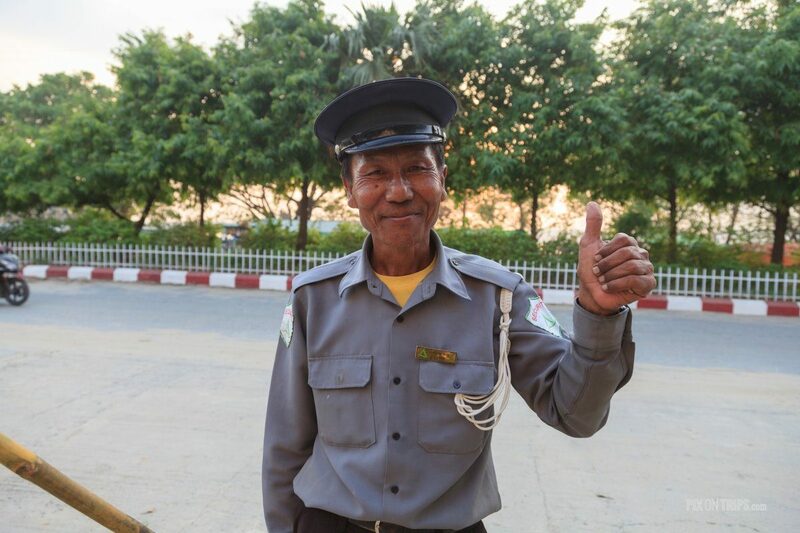 We bumped into this security officer on the way into the hotel who was happy to be photographed. True to its name, the rooftop restaurant offered views of the river. The next day, not wanting to try our hand at riding motorbikes in Mandalay traffic, we hired a taxi driver to take us around. He had learned some English at school and fed us tidbits of information on the sights we saw throughout the day. 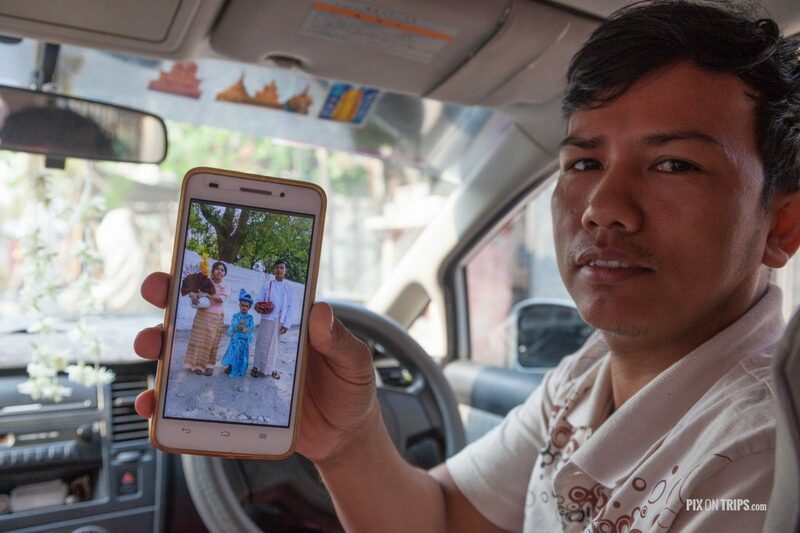 Through a game of broken telephone, he proudly explained that he owned the car he was driving (it had cost him US$8,000, which is more than six times the country’s GDP per capita and was still paying it off) and that his wife had been studying to become a lawyer before deciding to assume the duties of a full-time mother. 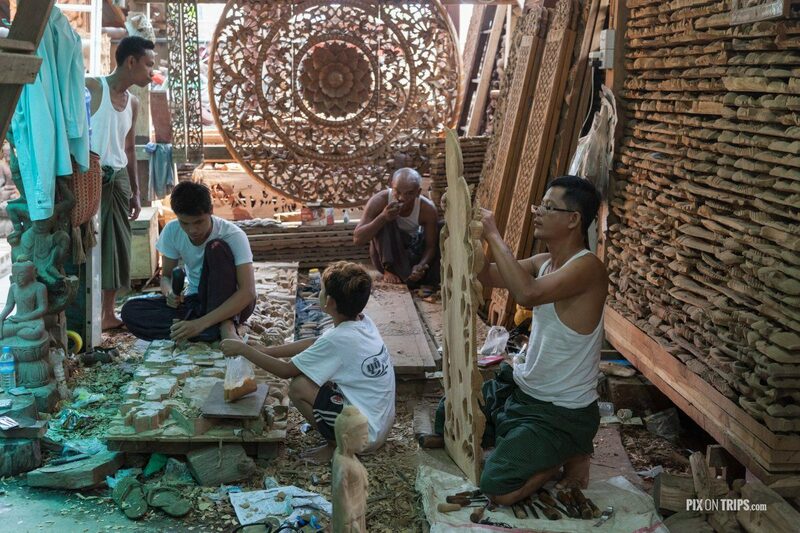 Mandalay is famous for its workshops and it seemed appropriate to start off our morning by visiting goldsmiths, sculptors, carvers and weavers. On our way to our next destination, we found ourselves stuck in traffic, in the form of a Shinbyu or novitiation ceremony (entering monkhood). These ceremonies often happen during the school breaks. 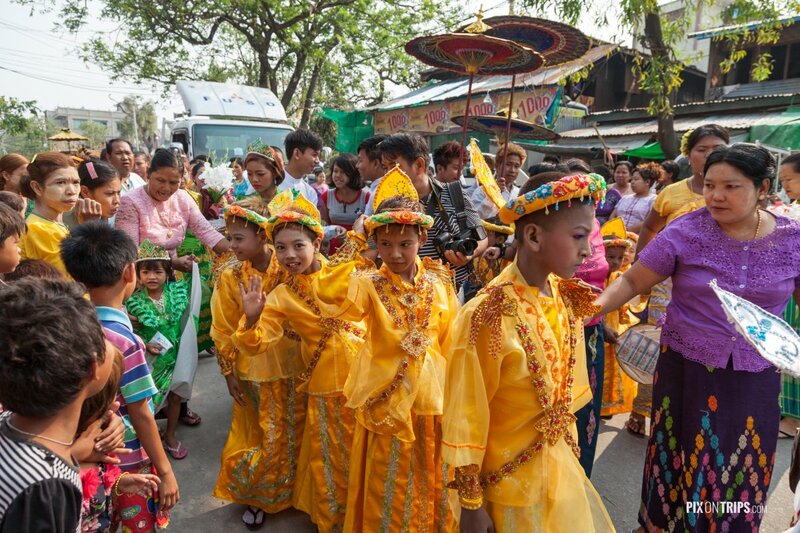 Young boys dressed ornately in gold attire, often with extensive embroidery, are brought to a monastery to be robed and to have their heads shaved. 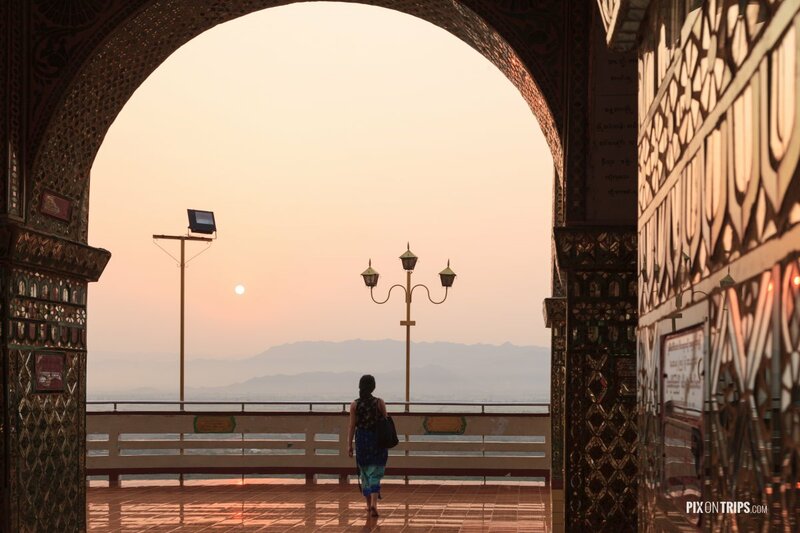 After asking permission, they then become novices, with novitiation being viewed as a rite of passage in the life of a boy, in the primarily Buddhist country. 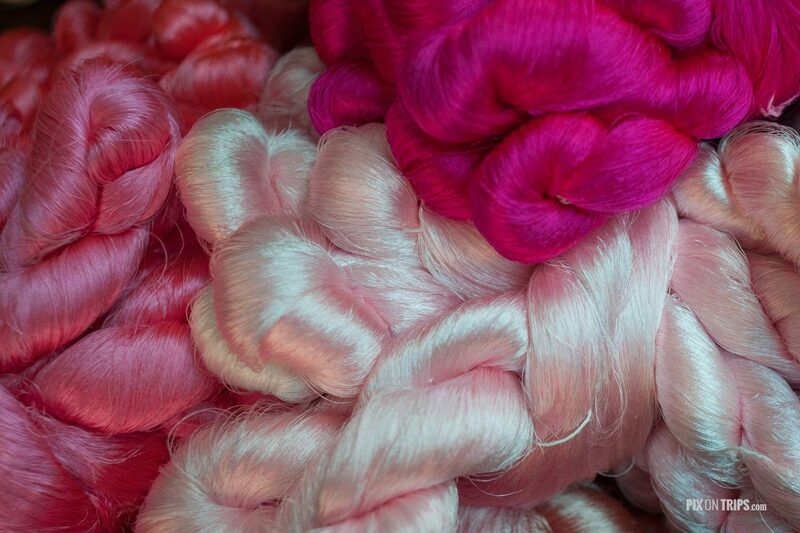 We asked our driver to pull over and watched the ceremony from the crowd in fascination. Next, we made our way to Mahagandayon Monastery to watch the monks line up for their lunch at 10:00am. Our driver explained that there are over a thousand monks living in this monastery, many of whom are trying out monkhood, but will leave after mere months. 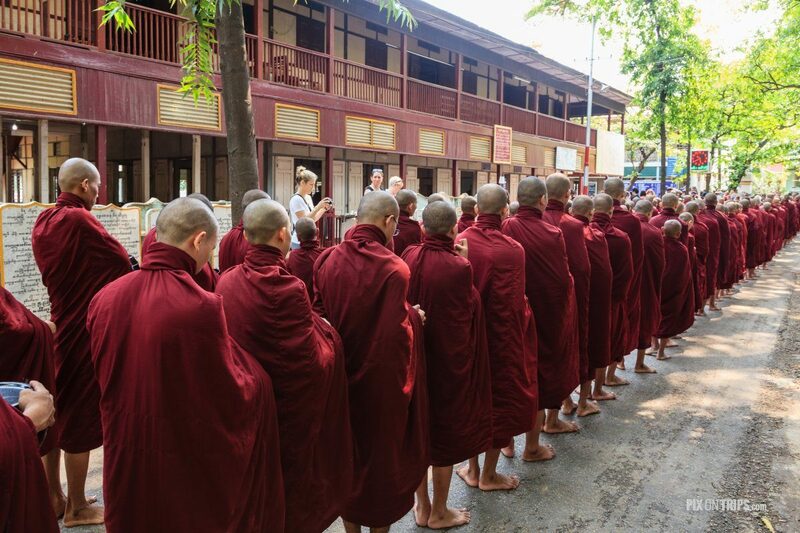 These monks eat two meals a day, both in the morning, cooked and funded by volunteers. It was a truly remarkable experience witnessing their daily routines, hindered only slightly by tourists obstructing their line formation for photos. 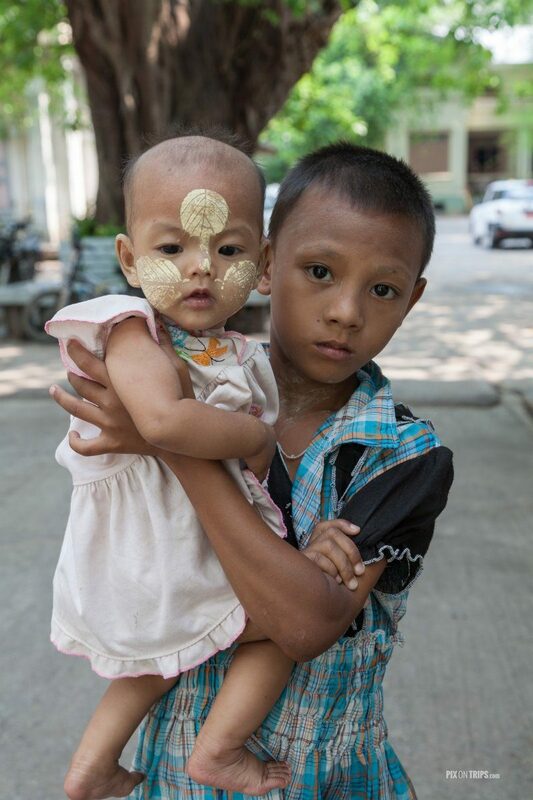 I snapped this picture of an adorable little boy who was approaching us carrying (presumably) his sister. He later asked us for money. We also saw this monk who was clipping leaves for food from a tree. 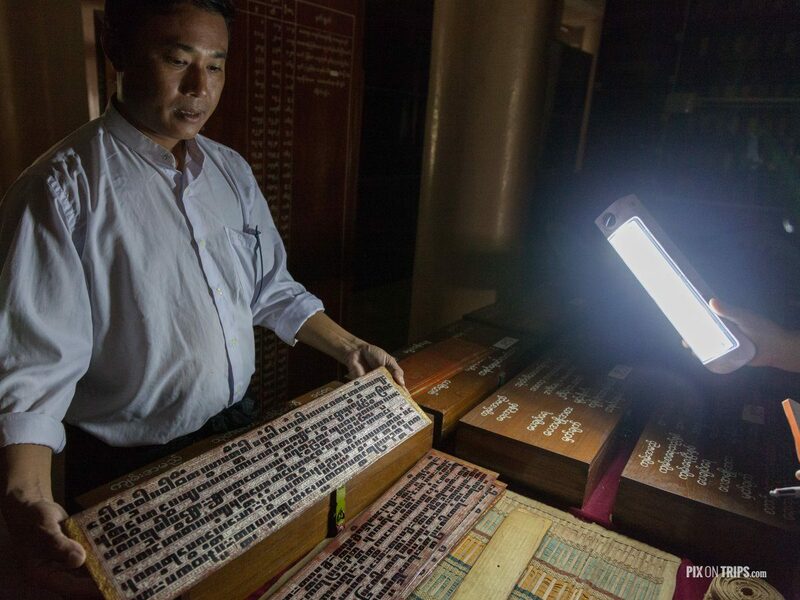 We then headed to Shwe In Bin Kyaung monastery, where we were shown Buddhist writings said to be over 500 years old, locked up in a musty, dark room downstairs. We felt extremely privileged as our driver later explained that the relics are only shown to foreigners with English-speaking guides. We were also allowed to touch the old papers, despite our choosing not to, and mused that someday this would likely become a museum with hordes of visitors as opposed to just a guide and the four of us. 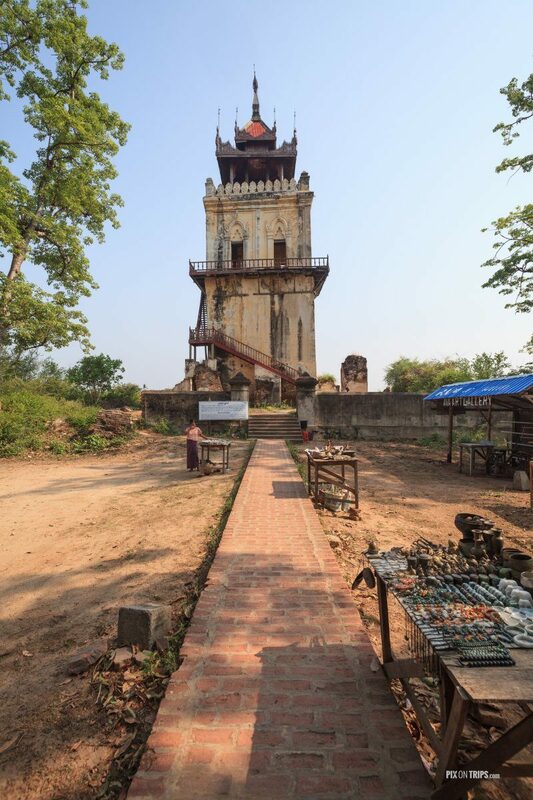 We visited Sagaing later that morning and then took a boat to Inwa or Ava after lunch, the ancient imperial of capital of Myanmar between the 14th and 19th centuries, much of which was destroyed by earthquakes in the mid 19th century, when it was then abandoned. 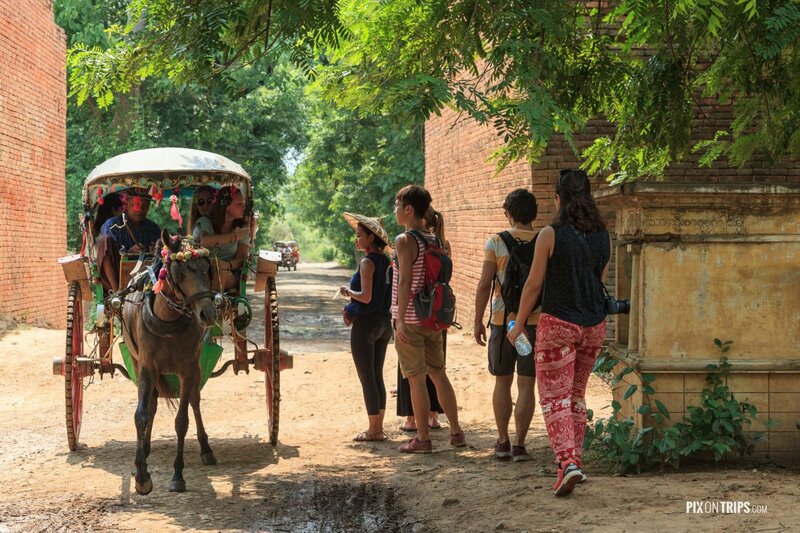 Despite initially planning to walk around the island ourselves, we eventually caved and took a horse carriage. This was later unanimously acknowledged by our group as a good decision given the size of the island. 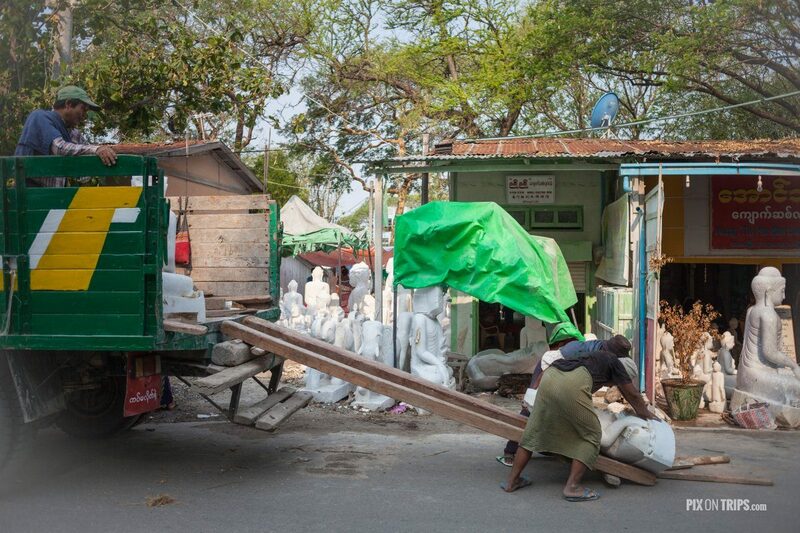 The sun had started to set by the time we had returned from Inwa. 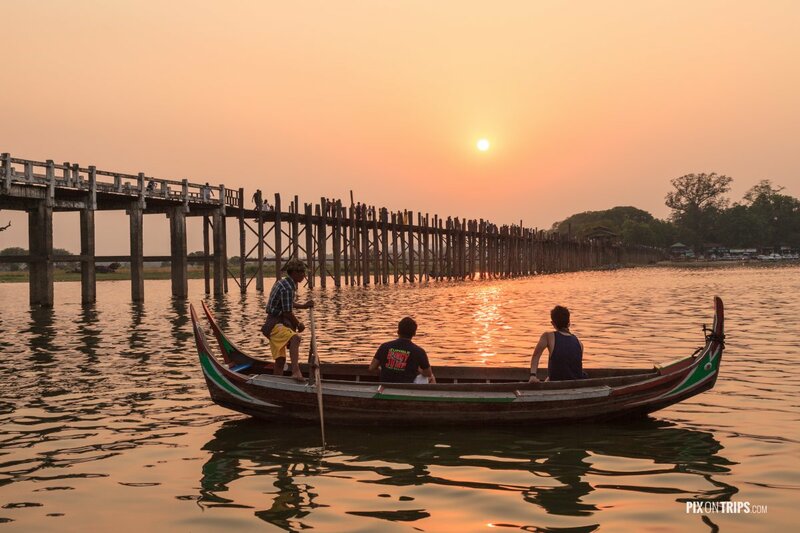 We made our way to the U Bein Bridge for sunset, the last stop of our day tour. 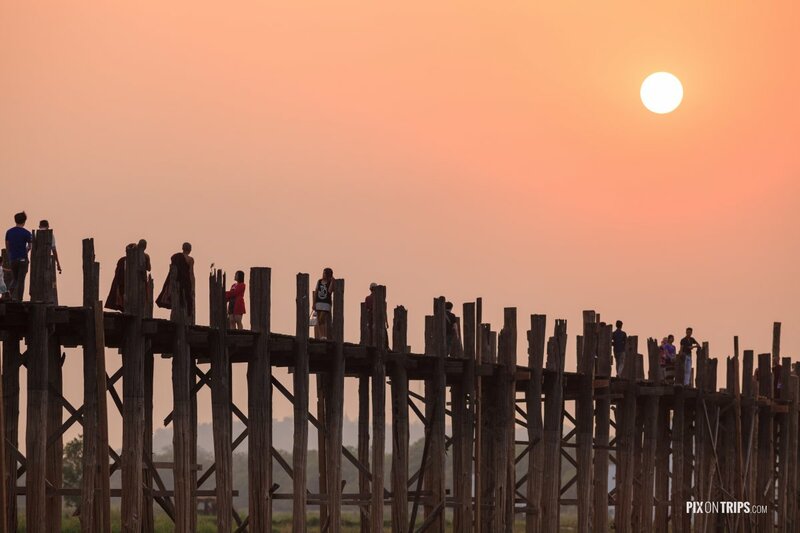 It is the world’s oldest and longest teakwood bridge at approximately 176 years old and spanning 1.2km. 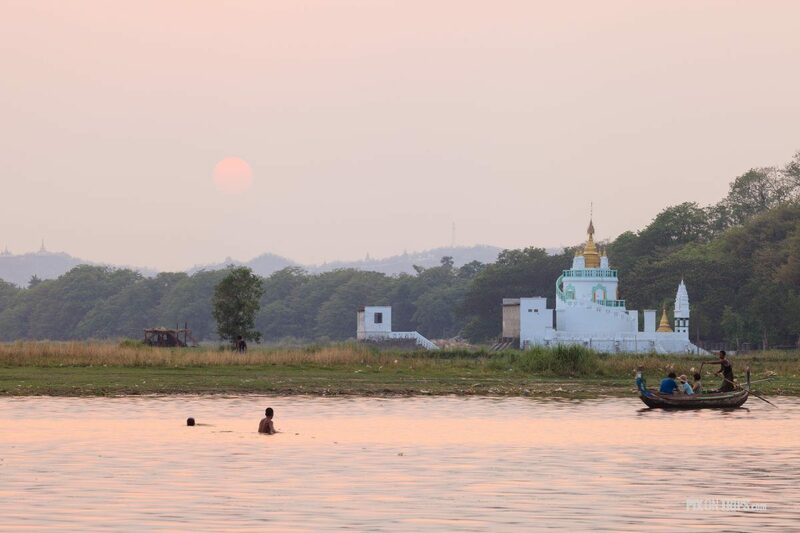 On either side of the bridge, fishermen had taken a break from their day job to take tourists out on the river for sunset, while a few children were swimming in the water. 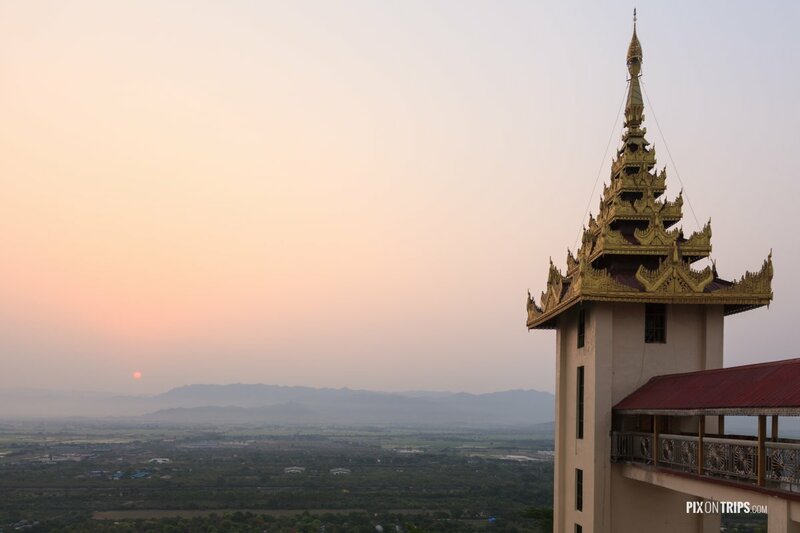 The next morning, we woke up early to catch the sunrise at Mandalay Hill. We then stopped at Kuthodaw Pagoda to see the world’s largest book and Sanda Muni Paya, where tablets of Buddhist texts are housed in stupas. 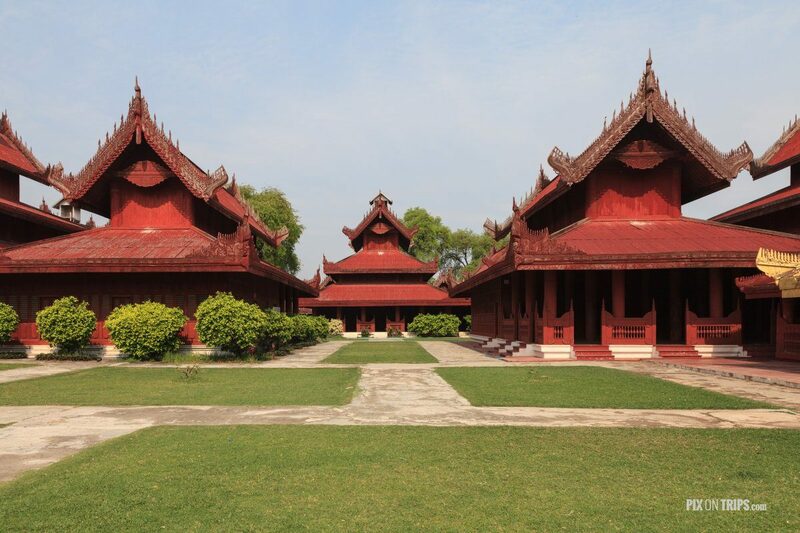 This was followed by a visit to the palace to round off our time in Mandalay whose architecture reminded me of the Forbidden City in Beijing. Overall, I think Mandalay is easily overlooked at face value, but highly underrated. There is much to see and I left wishing we had more time to spend in the city. 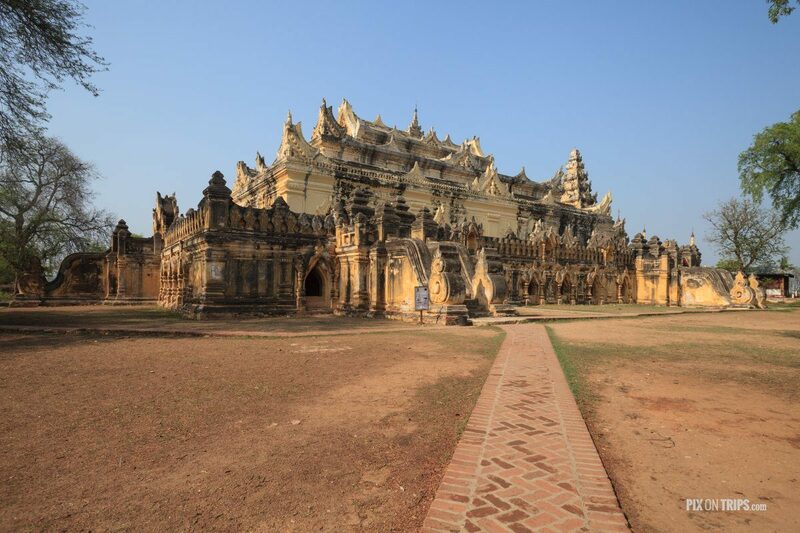 Following our two and a half days here, we took a bus to Bagan, which you can read about in the days to come.